Headline bombshells about James Comey, Donald Trump, and the Russian connection continue to explode at an alarming pace. But the future of health care — which is a little under the radar at the moment — is more salient for most Americans, as Jimmy Kimmel’s recent heartfelt monologue should remind us. New polls from Quinnipiac and Public Policy Polling show Democrats with double-digit leads in polls about hypothetical "generic" candidates in congressional elections, largely thanks to the health care issue. Quinnipiac reported that Democrats' 54 percent to 38 percent favorability margin over Republicans was “the widest . . . ever measured for this question" in its poll. PPP headlined its press release, “Health Care Puts House in Play,” and reported that the Democrats' 11-point lead over Republicans had risen from 6 points a month ago and was dramatically higher — 61 percent as opposed to 34 percent — among voters who said they were "very excited" to cast ballots next year. Republicans know they’ve got a serious problem here. Their heart’s desire rests on massively slashing Medicaid, the federal health care program for lower-income people. So they are now forced to pretend those huge cuts won’t have any ill effects. "You don't think anyone's going to be hurt by taking $880 billion out of the system?" George Stephanopoulos asked House Speaker Paul Ryan on ABC's "This Week." "No, no, I don't," the House speaker responded. "Because I think the micromanagement of Medicaid by the federal government, the Medicaid system isn't working." Health care debates often take the form of Democrats arguing in favor of specific policies [while] Republicans respond by saying, “That’s big government, that’s infringing on individual liberty, that’s violating free market principles,” and so on. The entire time we’ve been debating health care in this country as a federal issue, going all the way back to the 1930s and ’40s, the debate has taken that form. But the facts undercut this position, according to Hannah Katch, a senior policy analyst with the Center on Budget and Policy Priorities who is deeply familiar with both individual-level health outcomes and how health systems work at the state level. She pointed out that Medicaid expansion and private marketplace subsidies serve a common purpose, one that Republicans work overtime to obscure. Medicaid — a central federal welfare-state program, alongside Medicare and Social Security — has been on the GOP’s wish-list chopping block for decades, making it a logical point of focus. In a recent Center on Budget and Policy Priorities blog post, Katch highlighted five charts summarizing key Commonwealth Fund findings. 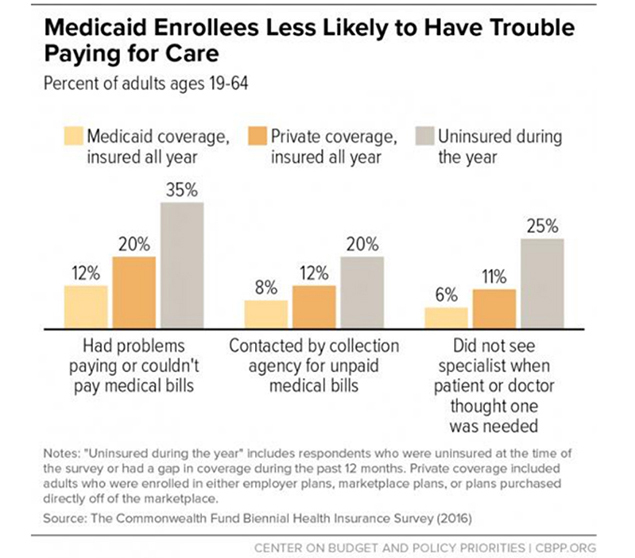 The first three charts focus on the adequacy of health care for Medicaid recipients, in contrast to those with private insurance and those who were uninsured over all or some of the previous year. 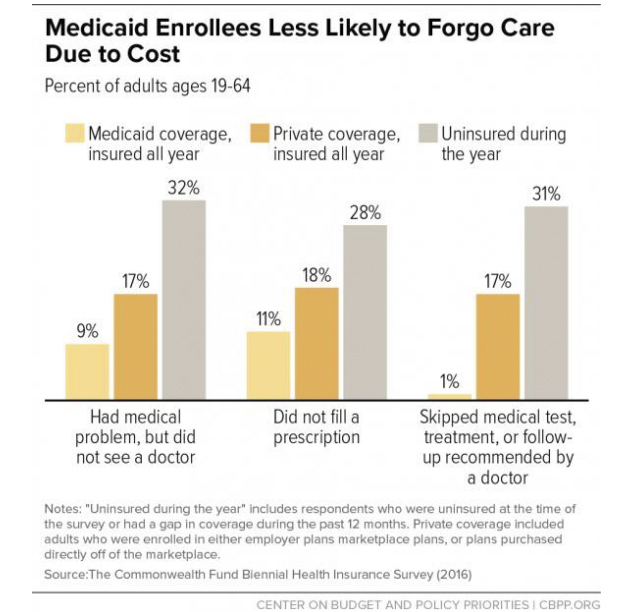 On the crucial issue of having a regular health care provider, Medicaid recipients had providers at rates very similar (91 percent) to the privately insured (93 percent) and much higher than the uninsured (77 percent). Second, on this issue of quality of care, Medicaid beneficiaries were slightly more likely than those who were privately insured to say their care was excellent or very good: That was 57 percent of the respondents compared with 52 percent. Pap tests: those with Medicaid, 77 percent; people with private insurance, 79 percent; uninsured, 67 percent. Mammograms: those with Medicaid, 71 percent; people private insurance, 75 percent; uninsured, 49 percent. Colon cancer screening: Medicaid, 62 percent; people with private insurance, 62 percent; uninsured, 42 percent. This last chart represents the real bottom line in terms of how effective Medicaid is at delivering the health care people need most. Medicaid turns out to do that significantly better than private insurance does — which is the exact opposite of what the GOP’s narratives insist. The focus on individual health outcomes is important, obviously. But the GOP is also completely wrong on another front — rather than “empowering states,” as Republicans claim to do, the changes they long to introduce will do the opposite, Katch explained. A number of states have created "health homes" for people with multiple, chronic conditions – people who have a mental health condition or opioid addiction, and may also have another chronic health condition, like diabetes. By giving these people some help navigating the health care system, states can help improve health and may be able to reduce costs over the long term. Medicaid caps will force states to ration care, rather than giving them the flexibility to invest in innovative programs like health homes. Oregon has created "coordinated care organizations," partnerships between providers and Medicaid health plans, which have been able to significantly improve coordination of care for some of their sickest patients. Oregon recently announced [it has] been able to reduce the number of avoidable emergency room visits by half. But it costs money to invest in new ways to provide care, and it also requires the states to accept some financial risk, which they won’t be able to do if they are struggling to figure how they're going to pay for basic services under a Medicaid cap. The House GOP rushed its bill through frantically, without even holding a single hearing, giving no time at all for a coherent public debate. However much the GOP's Senate leaders might want to do the same, it seems unlikely they can match the House for pure speed and secrecy. Once the doors are opened to public testimony, evidence like that cited by Katch — both about individual impacts and state-level systems — will have to be heard, provided there’s an organized effort to demand it. The time for concerned citizens to become deeply familiar with the evidence is now, before Senate Republicans attack.